Jean Sibelius (1865-1957) is the most notable composer in the history of Finnish music and one of the most influential men in Finnish culture. The core of his work is formed by his symphonies and symphonic poems which extend from Karelianism and National Romanticism to tonal experiments. He earned international interest already in the 1920s. A two-staged competition was arranged by the Sibelius society, founded in 1957, for a memorial to the composer. The second stage was taken by Eila Hiltunen's entry 'Passio Musicae'. The competition gained immense publicity; the conflict between the supporters of abstract and figurative art was in the air, but it was solved by adding Sibelius' bust to Hiltunen's work. The work is made unique by its spatial diversity of the work, allowing the viewer to enter it, and the echoes and sounds generated by the structure. Viewed from further away, its form blends in with the woods and rugged rocks. Eila Hiltunen's work started to become more abstract in the late 1950s. Simplification appeared side by side with a strong expressiveness. The rugged expressiveness of her works was influenced by the welding technique which Eila Hiltunen had pioneered in Finnish sculpture. 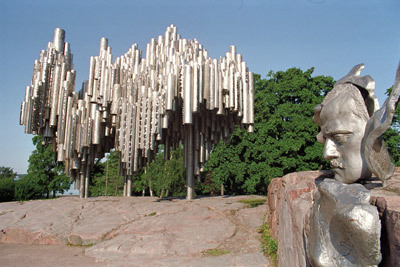 The monument is a visual expression of the way Sibelius' music depicts nature and it has become one of the most popular tourist attractions of the City. The Sibelius Monument was inaugurated on 7th September 1967 and it belongs to the collections of the Helsinki Art Museum. It is one of Helsinki's best known and loved tourist attractions. The work is made of acid-resistant steel and measures 8,5 m high, 10,5m in length, and 6,5m in depth. It consists of over 600 tubes and weighs 24 tonnes. A smaller version of the monument is situated in the Unesco headquarters in Paris and sculptural details of the work are located in the yard of the United Nations headquarters in New York. A sculpture of 6,5 meters high representing part of the monument was shown at the World Exhibition in Montreal in 1967 for the Exhibition Pavillion of Finland. On this occasion, the Finnish State donated the work to the City of Montreal.